At the time of the interview Daniel was about to star alongside Jefferson Turner in Potted Panto which opens at the Vaudeville Theatre on December 18th, 2011. 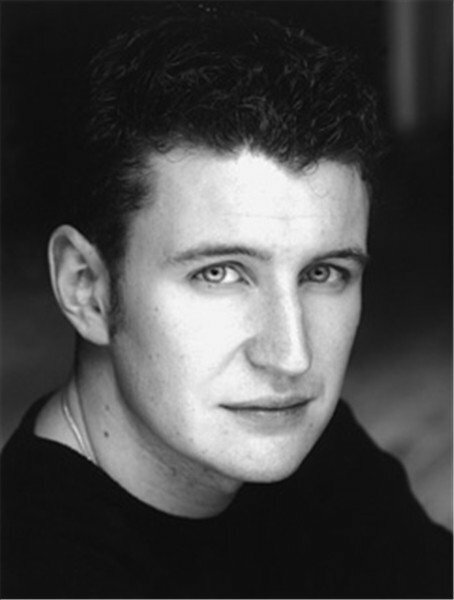 Daniel made his stage debut in Peter Pan and his television debut as an armoured knight before moving on to performing in several stage productions and television appearances including Emmerdale, Coronation Street and of course Blue Peter. 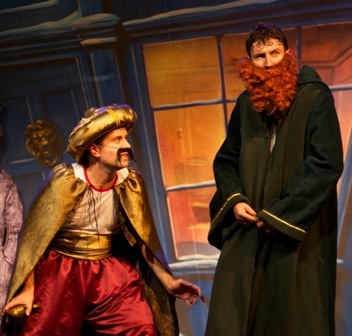 In addition to the current production, Daniel and Jefferson have written and starred in the very successful Potted Pirates and Potted Potter shows. Daniel recently took time out from rehearsals to answer some questions about himself and his career. You studied at Bretton Hall, graduating in 2000. What are some of your favourite memories from your time there? Bretton Hall was a truly one of a kind place! It was this old stately home slap bang in the middle of Bretton Sculpture Park surrounded by acres and acres of vast woodland and countryside. So some bright spark had the idea of adding a few hundred wannabe actors, dancers and musicians to the mix. It was like ‘Fame’ meets ‘Last of The Summer Wine’! It was a great place to train. Stage was when I was about 10 and was John in Peter Pan. I got to fly and everything! Screen was when I was about 18. I was in a film called the ‘Usual Children‘ as the Black and White Knight. I got to wear this amazing chain-mail and armour combo. And I learnt a valuable lesson – if someone asks you if you can ride a horse, don’t say yes just in the hope of getting more lines! I still wake up from nightmares of this huge black horse galloping across a field with me being thrown from side to side in a suit of armour, trying not to lose grip of my axe and holding on for dear life! You have performed in Emmerdale and Coronation Street. What is it like being in two of the nation’s most loved soaps? Both were great experiences, and gave me new-found respect for soap actors, they are some of the most hardworking people I’ve ever met! I have to hold my head in shame and admit I don’t really watch them very often, so much so that on my first day on set in Corrie I mistook quite a famous soap star, who shall remain nameless, for a runner and asked her for a cup of tea! She didn’t look very impressed, but fair play to her she went and got me one! Was so embarrassed when I found out! You have performed in several children’s theatrical shows. Is this a career choice that you have made and if so why? It was never really a career choice. I always wanted to go in to comedy but I just seemed to always get work in children’s theatre! But it soon became something I really enjoyed doing. Playing a comedy show to a room full of adults, that’s one thing. Playing to a room full of kids is where you sort out the men from the boys! How did it feel being the “In-House Story Teller” in Blue Peter, one of children’s TV’s most celebrated programmes? It was amazing to be part of that show! Was a true honour. My Blue Peter badge is still one of my most treasured possessions! 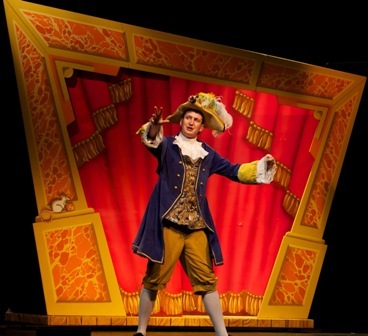 You have co-written and co-starred in Potted Potter, Potted Pirates and now Potted Panto with Jeff Turner. How would you describe the shows? High energy, fast paced, madcap comedy romps! Watch two grown men, who should know better, condense down the stories you all know and love in ways you never thought possible! And we’ll always end on a song! How long does it take to write the material for the shows? Usually between 3 and 5 months to write the initial script, but the joy of these shows is that we have the freedom to constantly change things. We’re always adding bits or trying new stuff to improve the shows or simply so I can make Jeff laugh on stage! Is the target audience just children or is it also for adults? Our target audience is literally everybody! We’re bringing back the family comedy. We want everyone sitting in that theatre, young or old to be laughing together. We’ve had a hen party sat behind a 10-year old’s birthday party before, both groups shrieking with laughter! Because at this festive time of year, where else can you get 8 pantos for the price of one, watch two men play everything from princes to fairies, wicked queens to panto cows and take part in the first ever on stage panto 3D Experience? If that’s not value for money I don’t know what is! Fingers crossed we’re taking Potted Potter over to North America, all the details are being sorted out at the moment, all very hush hush so don’t tell anyone! Very exciting! You have performed together on stage with Jeff Turner quite a lot. Is there a comedy double act that you model yourselves on? I think the double act everyone aspires to is Morecambe and Wise. I still have a newspaper clipping on my wall that compared us to them! It was the greatest compliment I think I’ll ever receive, I’m gonna have to have it written on my gravestone! You have both worked on CBBC, and on stage. Do you have a preference for TV or live theatre? Doing live TV is a lot of fun, often terrifying knowing that you’re being beamed into millions of people’s front rooms, but at the same time it gives you a real buzz! However nothing can really ever compare to live theatre! Let’s be honest it’s why any actor goes into this crazy business. The thrill and feeling you get in that moment when the beginner’s call is given, just before the curtains open and you can hear the audience settling in their seats, it really can’t be matched! Well as you’re not telling Jeff, I’ll get my list out! I would love to work with Eddie Izzard, he was one of the first stand-ups I ever saw live and I immediately fell in love with his style of comedy. But if it could be anyone, it would have to be Tommy Cooper. The man was a legend who I think must have been born with natural comic timing! Even today, years on, his sketches are as laugh out loud funny as they were back then! At one time you were doing ‘one-man fairy stories’ around clubs. Can you describe this? It was a one-man version of Sleeping Beauty. I think some of the jokes actually got recycled and appear in Potted Panto! It was inspired by (stolen from?) Tommy Cooper’s sketch where he uses all the different hats to tell a story. It was a lot of fun to do, and took me out to Lapland for a few months over Christmas. I got to stay in a log cabin with Santa, whose name is actually Dave. And he lives in Blackpool with his mum! I understand that you found Jeff busking in Covent Garden in 2005 and you thought he was funny. What exactly happened? I had met Jeff before, so knew he existed! I’d just been in a meeting about an idea for the launch of the 6th Harry Potter book which then went on to be ‘Potted Potter‘. I was walking through Covent Garden, spotted Jeff so thought I’d stay to watch his act. I really enjoyed it, and decided that if you squinted he looked a bit like Harry Potter! So we went and grabbed a drink afterwards and the rest, as they say, is history! I love Cinderella. It really does have everything a good classic panto should have. I had the chance to play the Ugly Sisters with Jeff a few years ago. It was the most fun two men could have with dresses on! You and Jeff are both Monty Python fans. What is it that you like about the show? For me it was always just how surreal everything was. It taught me that you could literally do anything in a sketch and take it anywhere you liked, no matter how strange. I always loved how their sketches would never really end, they’d just flow into something new. Sleep! Don’t get many days off, so when I do I like to try and get back on speaking terms with my bed! It often feels very neglected! Morecambe and Wise! There is no competition! I like Chris Evans, but it’s gotta be Tony Blackburn, the man is a living legend! Monty Python, they were the trendsetters that cleared the way for everyone else! Gotta be Cinderella, in Jack I just feel sorry for the giant! Poor guy – some chav breaks into his house, nicks all his stuff and when he objects they kill him! Thank you for all your support, for coming to see all the shows and for continuing to let me and Jeff make a career out of messing around! Thanks Daniel for taking time out from rehearsals and best wishes for Potted Panto!